The rally in the Sensex came at a time when global markets have been struggling over the last one month and macros have not been too encouraging. The sharp rally in the Sensex (as it scales 38,000) has been esoteric to some and astonishing to many. The rally in the Sensex came at a time when global markets have been struggling over the last one month and macros have not been too encouraging. The US-China trade pact is not yet on but the US-North Korea nuclear agreement is certainly off. Oil prices are again headed higher and the BREXIT uncertainty continues to loom over UK and the rest of Europe. But first the Sensex story! Has the Sensex really outperformed key markets? Since the first week of March, the Sensex just chose to ignore the global cues and surged ahead. The Sensex has already crossed the 38,000 mark and looks poised to better its previous highs. The nervousness of September and October last year looks like a distant memory. Check the chart below. To get a clearer picture of the rally in the Sensex, we have just considered the rally over the last one month. Let us look at how the Sensex has performed vis-à-vis a cross section of global markets? 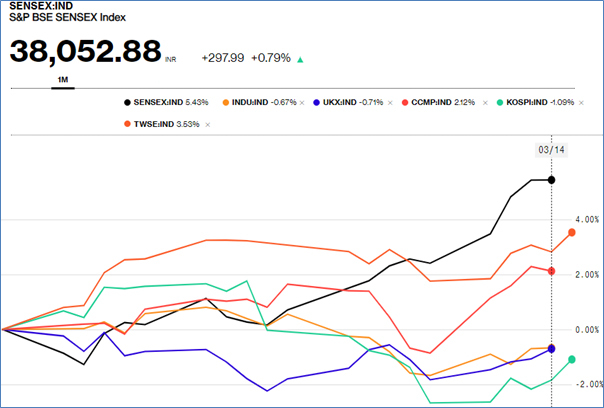 The Dow, Footsie and the KOSPI have given negative returns during this period. Even the positive return markets like Taiwan and the NASDAQ have lagged behind the Sensex. What exactly explains the whopping 5.43% returns delivered by the Sensex in the last one month? Actually, there have been three reasons for the same. To understand the rally in the Sensex it is necessary to look at the surge in foreign portfolio investor (FPI) inflows since February 20th. The FPIs have infused more than $4bn into equities in less than a month and that has not only propped up the Indian rupee but also pushed up the Sensex. Check the chart below which captures the cumulative FPI flows into Indian equities since February 20th. We have captured the cumulative chart of FPI flows into equities since February 20th to get a clearer picture. But why is FPI money surging into India? Firstly, the FPIs are betting on a revival in earnings growth on the back of improved sales performance and better margins. Secondly, the macros are in much better control. Inflation is under control, the rupee is in check and global oil prices are range-bound. With an economy size of $2.6tn and above 7% growth, India is surely a market the FPIs would not want to lose out on. Above all, even the liquidity shortfalls have been addressed. That explains the FPI flows. The fears of an escalating situation on the Indo-Pak border have largely receded. Both the nations have made a noise and wiser counsel has prevailed. The rupee is showing strength and that has been a major positive for global flows. With inflation in check and the RBI looking to cut interest rates further, the recipe for a revival in growth may be there. Above all, the Sensex rally is betting on the fact that the PSU banks may finally get into cumulative profits in 2020 and that could have a geometric impact on industry in terms of credit availability. With oil prices in check, the trade deficit and the current account deficit may not be an issue, after all. Liquidity issues are addressed and the $5bn RBI dollar swap will only improve matters. Just a few months back, markets were in a state of confusion. The ruling NDA had lost power in the 3 crucial states of Madhya Pradesh, Chhattisgarh and Rajasthan. That had raised serious doubts over the ability of the NDA to repeat the magic of 2014. However, sentiments appear to have changed drastically after the Pulwama attack and India’s quick and decisive retaliation. With the improving prospects of the NDA, investors are once again hoping that reforms will be work in progress. Of course, for the final answer we will have to wait till May 23rd.